I wish I had a joke for this – anyone good at writing jokes?!? Leave them in comments! I wanted to originally do an escalator. A shopping penguin. But that needs more practicing, but I figured I could do an elevator MUCH more easily! Watch the video below or click HERE to see it in HD on YouTube. She is adorable. Thank you very much for sharing. So cute. Now I want a dog/cat week. What do you say? Please please please. Wonderful way to end penguin week, a busy happy shopping penguin. Love her hair band or is it fur band, what do penguins have officially ? Thank you for 7 very fun, colourful scenes this week, what’s the next topic for a week of cards ? What a great card to finish Pinguin Week. This card is gorgeous,love that she is in a elevator, nice idea LOL. You say in more videos when you are drawing/colouring space around your focal point that you are eyeballing it instead of for example drawing it with a ruler. I think that when you do it like that, it’s far more natural then using a ruler. Thank you for that great tip, I used it already a few times. Sandy thank you so much for a great Pinguin week, I loved everyday of it. Have a nice weekend. 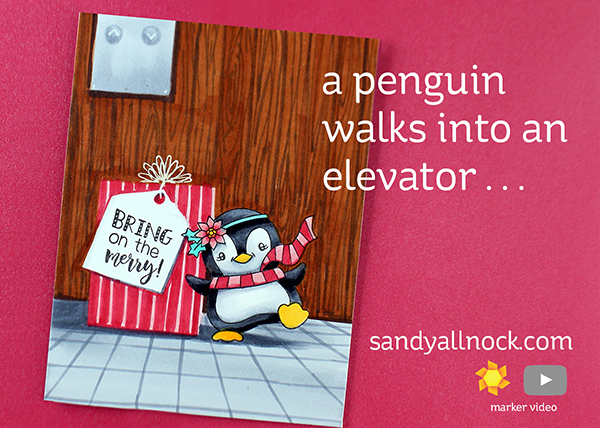 A political joke…..a penguin waddles into an elevator ….. and says when they go low..we go high! …you think she would have seen it..
Adorable, and I loved watching how you created you little scene. Thanks so much for doing this miniseries. I thoroughly enjoyed it. I am now anxiously awaiting my new Copics to arrive from the UK so that I can dive into your Copics jumpstart class. What a fun idea to take a penguin out of the snow for a change. 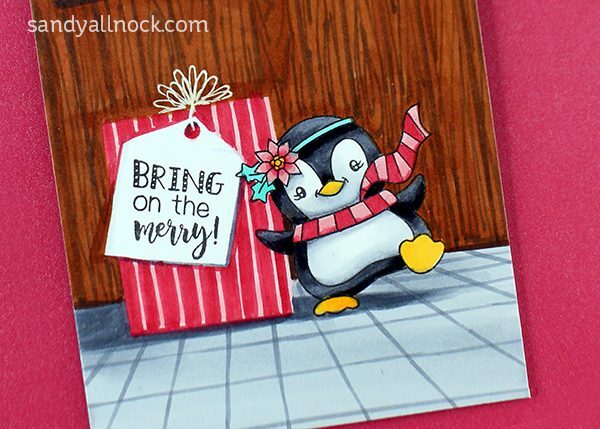 I really like these Darcie’s stamp sets – always cute critters and often wonderfully lame puns too! And they’re small – sometimes the big involved sets can be a sensory overload. 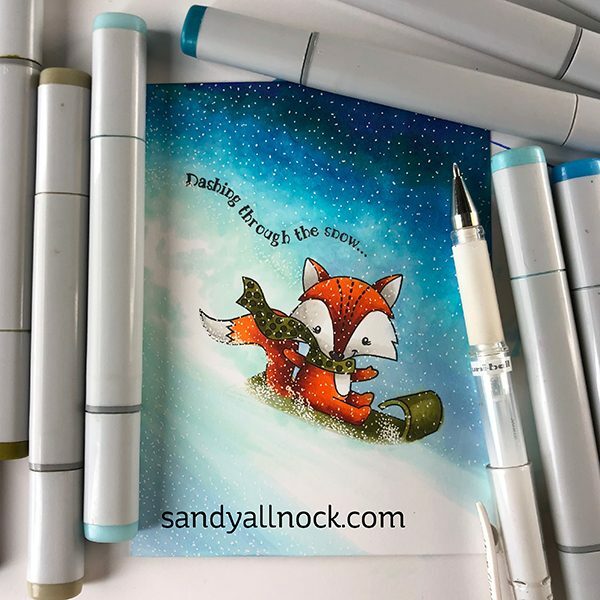 These are perfect for a quick card… unless you’re Sandy and have to make the whole scene around them, of course! But you always make it look easy, so don’t ever stop!